People that love to run tend to train pretty hard, and some even verge on overdoing it. While regular, high-intensity training can help you reach your running goals and get you in great shape, it can also lead to a variety of different injuries. If you love running or rely on it as exercise to stay in shape, chances are you aren’t going to stop, and you don’t need to. You do need to be careful with your body, however, and make sure you do as much as you can to prevent injuries that can hobble your running schedule and your body. Every athlete in the world knows the importance of stretching; however, it’s pretty easy to get in the habit of skipping your stretching routine, especially if you’re in a hurry to get your workout going. Ideally, you want to reserve about 10 minutes before you go running to stretch. Stretch your whole body and do running-specific stretches like high-knee drills and bounding arm circles. If you’ve had any recent injuries, taking a few minutes to make sure that area is loose and warm is important as well. You should also take a few minutes to stretch after you’re done running to prevent muscle soreness. This is particularly important if you run every day because muscle soreness can cause you to alter your gait the next day, which could result in an injury. 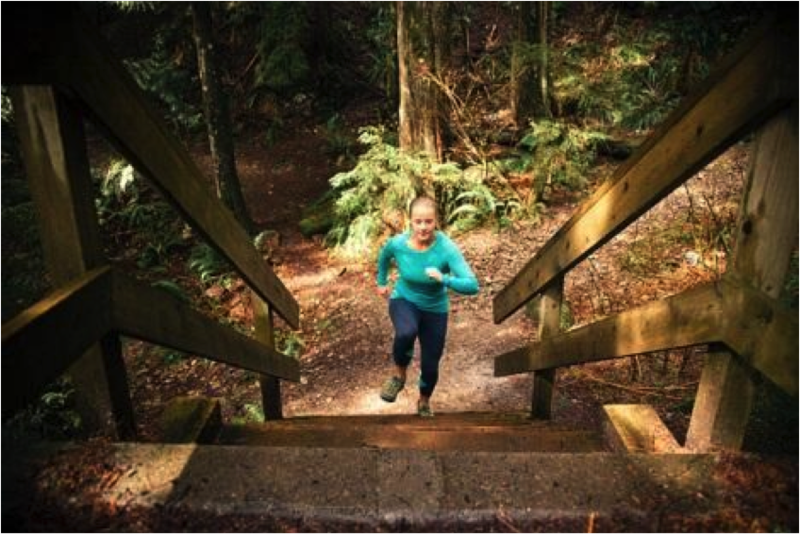 Many runners don’t think about strength training, but it can have some vital benefits. Strength training regularly improves overall athletic ability and physical power in your running, but it also strengthens muscles, helping them to fight off strain-related injuries. For runners, body-weight strength training exercises are ideal, and heavy lifting really isn’t beneficial. If you’re going to lift weights or use machines, choose lower weights for more repetitions instead of heavy weights for fewer repetitions. 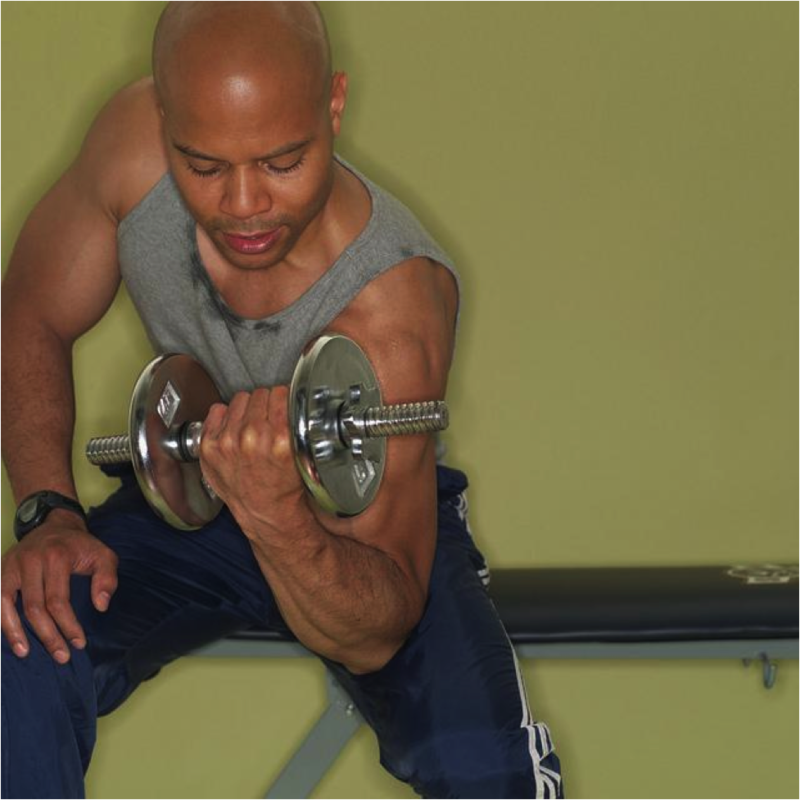 Heavy weight will increase bulk, which won’t make you a more efficient runner. As much as training the right way is important, taking rest days to allow your body to relax is essential. When you just start out, taking a day off after a workout is ideal. As you progress or if you’re already an experienced runner, taking two rest days off per week is beneficial for some. If you’re training for a marathon or other goal, taking only one rest day per week is fine, but you need to be careful when it comes to listening to your body and any growing injuries. On your rest days, try doing something beneficial for your body like getting a massage. You can either look into working with a massage therapist or practice self-massage to help ease sore muscles and relax after a workout. You can use massage lotions or ointments during your massage to help further repair any aching muscles or even treat blisters. In addition to stretching, strength training and taking rest days and getting a massage, it’s also essential that you eat right and drink plenty of water when you’re training. It is also very important that you take the necessary daily vitamins to keep performing at your best. Doing all of these things together can help you reach your training goals and keep yourself free from injuries in the process. 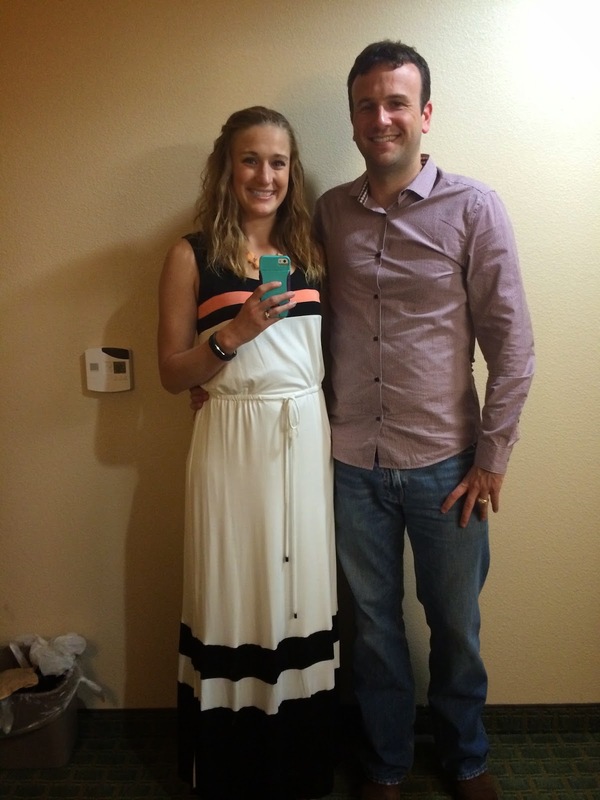 Shannon Lochwood is a health enthusiast and writer living in California! She enjoys writing about personal fitness, nutrition and supplements. Her passion is to encourage other to make their health their #1 priority. 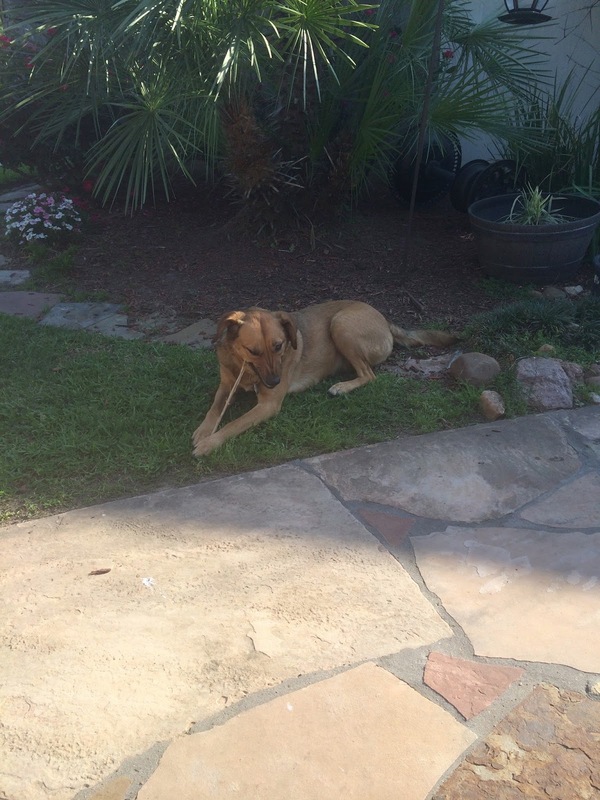 Shannon really hopes you enjoy this article! There you have it! Make sure you really have a think about these tips and don’t overtrain. Those of you quickly approaching your goal races, hang in there, stay strong, taper well and kick but in your race! Working out is all about finding a happy balance in your life. Too much can be just as bad as too little! Find a way to even it out and find your happy place. After all, life really is just a balancing act! It’s true y’all. Home is where the heart is! I love the home that JP and I have built with our little family of four (you know, with my two fur babies). But there is something about escaping the comforts of your day to day home to your “other” home. I still consider my parents house home. I still have, and will always have, a room there. I feel comfortable, loved, at ease and most of all happy when I’m there. I can leave my home where I can think of tons of chores, tasks and other things to do. Instead I can relax, help out my parents and not worry about all the little things at home. This weekend, I escaped to my parents while JP was away on a guys weekend! I drove to Sugar Land early Saturday morning to meet up with Emily and Matt. 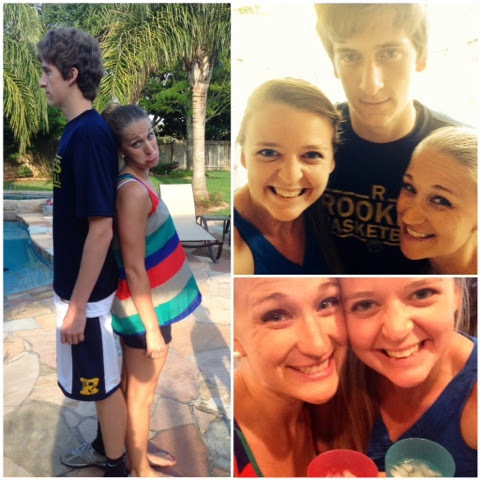 My parents both had to work that morning, so Emily and I took Matt to the first game of his basketball tournament. Dad met up with us there and we watched Matt’s team dominate! 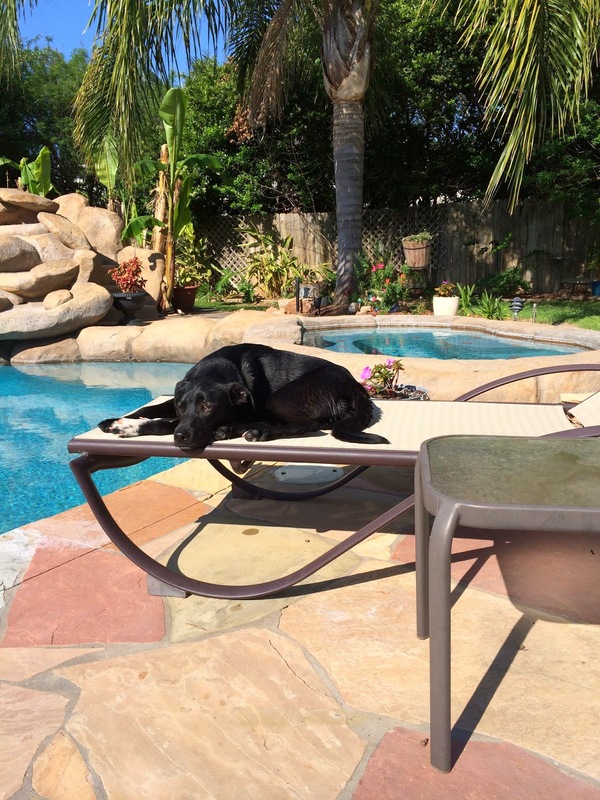 Then it was time for some poolside sunshine. Of corse the dogs had to be involved. They make it quite hard to relax sometimes. It’s too bad they’re so cute! 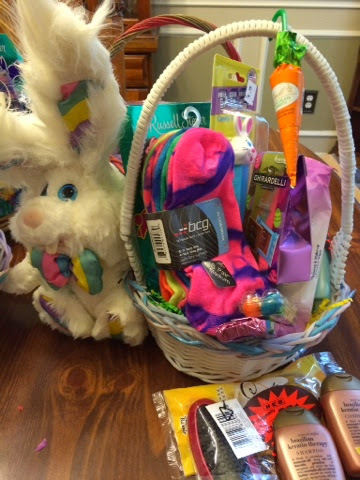 After being outside for several hours, Emily and I went to the store to buy discounted Easter candy and then we stuffed Easter eggs for our belated Easter celebration. 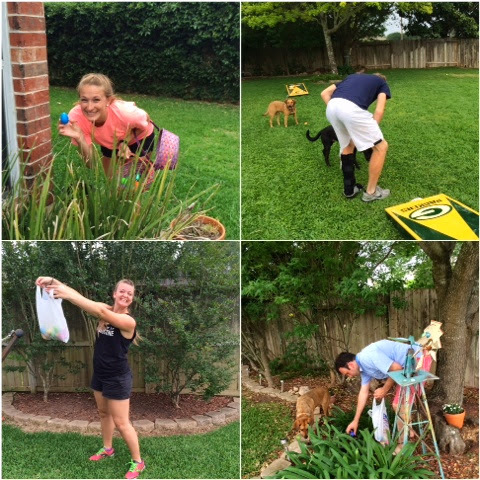 We’re overgrown children, so we LOVE to have Easter egg hunts! Post stuffing eggs, we just hung out outside with the family: joking around, taking pictures of how much bigger my baby brother is than me, burgers for dinner and then back out to Matt’s basketball tourney for another game at 9:20pm! The team won, but Matt sprained his ankle towards the end…it doesn’t look too good. Sunday morning was pretty much as perfect as can be. The weather was beautiful, so we sat outside for a few hours sipping coffee, enjoying the weather and just chatting. Once we decided to join society, Mom, Emily and I went on a grocery run to Aldi’s! I only go there when I’m with my mom and I really found some great deals this time around. Good thing too because JP and I had an empty fridge and freezer. Now they’re both overflowing! We didn’t get home until after two, so we headed up a pizza we picked up at the store and munched on that while we lounged for a bit. Later JP came back from his boys weekend and my Uncle Mike (Mom’s brother) came over! He’s in town for work and is able to spend some time with us so that’s awesome. Before dinner, Dad and Uncle Mike played Easter Bunny and hid all of the eggs that Emily and I stuffed on Saturday! They boys acted less than enthused, but Em and I had a blast. Secretly, I think the boys loved it. I mean, candy! Come on! 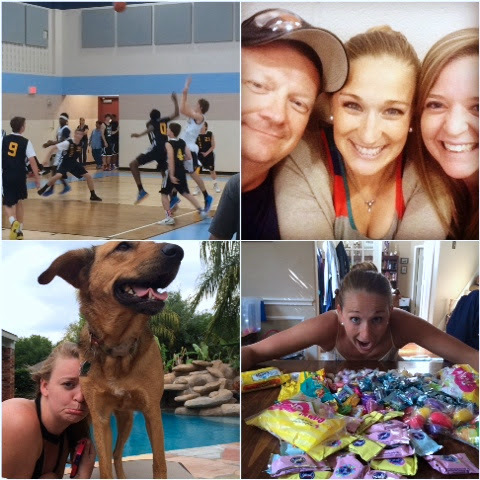 The rest of the day was spent opening Easter baskets, playing corn hole and eating a yummy BBQ rib dinner! Yup, it really doesn’t get much better than that. No worries, just relaxing and spending time with some of my most favorite people on the planet. They only thing that would have made the weekend better is if Benny Boy was home from Colorado! Do you love going to your childhood home or do you prefer your own home? 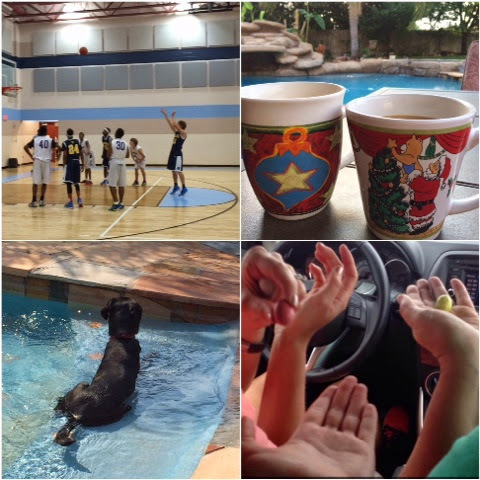 What makes a perfect weekend for you? Oh hey there friends! Remember that one time I didn’t show up until Tuesday then I crawled back into my little hole until Friday? Yeah, not sure what’s going on, but business has ensued! New goal, get blogs started on weekends so I can share more with y’all since clearly blogging during down time at work isn’t happening. Why? Oh because there is no down time! I’m a busy lady and certainly not complaining. I’m loving it! Guess what I’m also loving? The fact that it’s Friday. Friday is my favorite so it seems like the perfect time to talk about some of my current favorite things! Yup, that’s right, they’re awesome and they’re all my favorites. I’ve been at my gym now for nearly 4 months and I’m almost at 10 clients. Plus, every client that I started with is still training with me. I’m still feeling great about this career change! Ever heard of it? It’s this awesome half stability ball that you can do all sorts of balance, cardio and strength work with! I think a BOSU workout is in store for y’all! Has anyone seen one of these at their gym? I first learned about Not Your Mother’s when I received an Influenser VoxBox last spring. First off, it smells amazing. Secondly, it really works and gives your hair that texture needed for volume. This has been great since I’ve been air drying my hair more and more. I’ve been avoiding the straightener and just embracing my semi-frizzy waves. The texture spray gives it a bit of ump like you’ve been at the beach getting some ocean air! Also awesome for a personal trainer! I get tired of the same old bun or ponytail because let’s be honest, having long hair is impossible to keep down as a trainer. I’ve gotten even better at half braids into buns or ponytails or even a braid across the front. It’s the perfect “I didn’t wash my hair” do. Nom, nom, nom. So many flavors, so little time. My favorite part about these little bars is that they have a naturally sweetened line! Low carb, no sugar added, sweetened with Stevia and Erythritol, 20g of protein and gluten free for those of you who can have the glutes! Since I’m up at 4:00am every day (not one of my current favorites), I eat two breakfasts every day. I have one before I start training, between 5:30-6:00am, and another between 8:00-9:00am. I love Quest Bars for my first breakfast. I try to get a good amount of protein in the mornings to keep me full longer and to get my body going! This is especially good for the mornings I teach classes! One more thing, they’re a great way to have something sweet and you’re cheating clean! I am obsessed with this actual spring we’ve had in Texas. Sunny days with highs in the mid-70’s. This never happens y’all. The pups have loved it too. We go on tons of walks and the park is our current favorite location. That or my parents’ backyard! There you have it, just a few of my favorite things currently 🙂 Those along with fun, fitness and Fridays. Y’all know I love some alliteration. I hope y’all have a wonderful Friday and an even better weekend! I’ll be back in full action next week! What are your current favorite things? This past weekend, JP and I went on a wonderful anniversary trip to the beach! 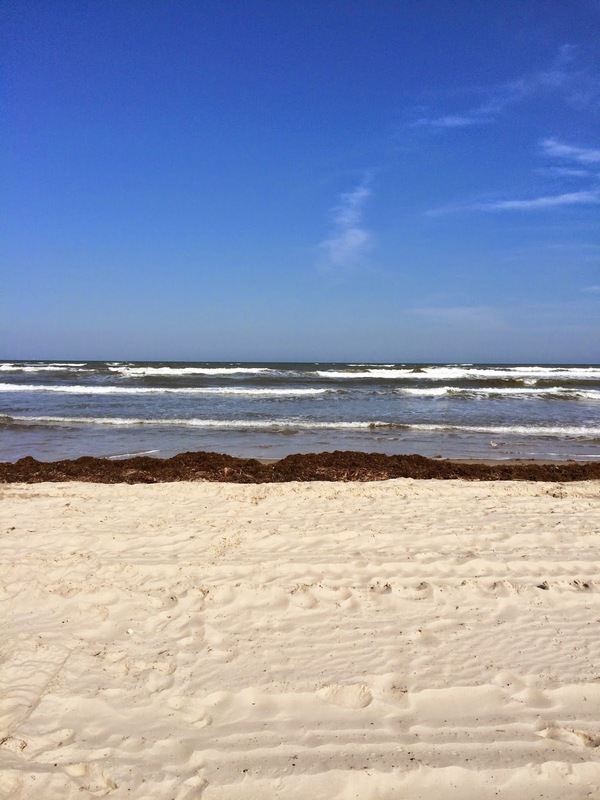 Now, I know that Texas beaches are far from the best, but after a coupes up, cold winter, I was craving sand between my toes. Luckily, we do live close enough to a beach that is actually pretty nice. A 3 hour drive and we’re in Corpus Christi! I wanted to share with y’all some of the things we did and where we stayed to help anyone out that may want to take a nice weekend getaway! Before I get started, let’s have a chat about where we stayed! We stayed at the Hampton Inn off Navigation near downtown Corpus. This location worked great for us because we were close to North Beach which is downtown, along we a a few other attractions we wanted to do! 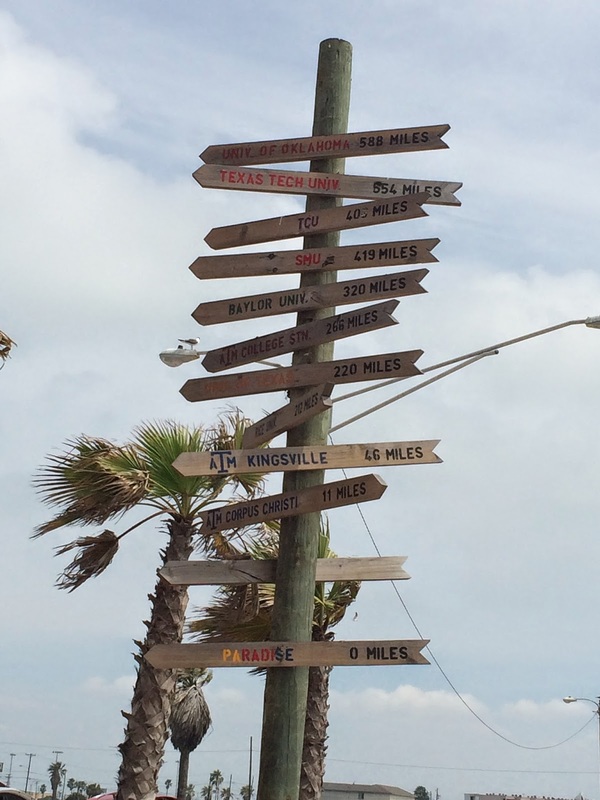 There are other hotels closer to Padre Island which is a nice area as well. The hotel was very clean and our room was just perfect. Plenty of space for me to spread out the multitude of things that I packed for only 2 nights. What can I say, I’d hate to not have something I want! We got to Corpus around 3:00pm on Friday. Just in time to check in, put our stuff into our room, change and head to the beach! 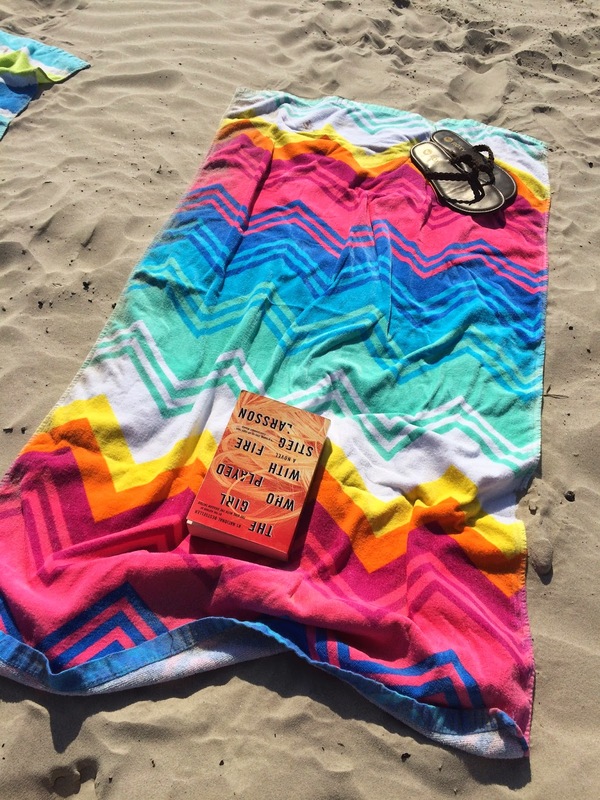 We stayed at the beach for a few hours soaking up the sun and walking on the beach. The water was chilly, but we still managed to walk through it a bit. Mostly because the soft sand was hard to walk on (we were totally sore the next morning!). After the beach, we cleaned up and went to a nice dinner at a quaint little Italian restaurant that my sister recommended, Luciano’s. Oh yum, Emily did not steer us wrong! I had the pasta primavera with shrimp. I mean, just look at how tasty! Obligatory iPhone in the mirror selfie of my handsome man and me! Since I’m practically incapable of sleeping in, we were up and at ’em before 8:00am Saturday morning. We took our time and went down for breakfast before getting ready for the day. 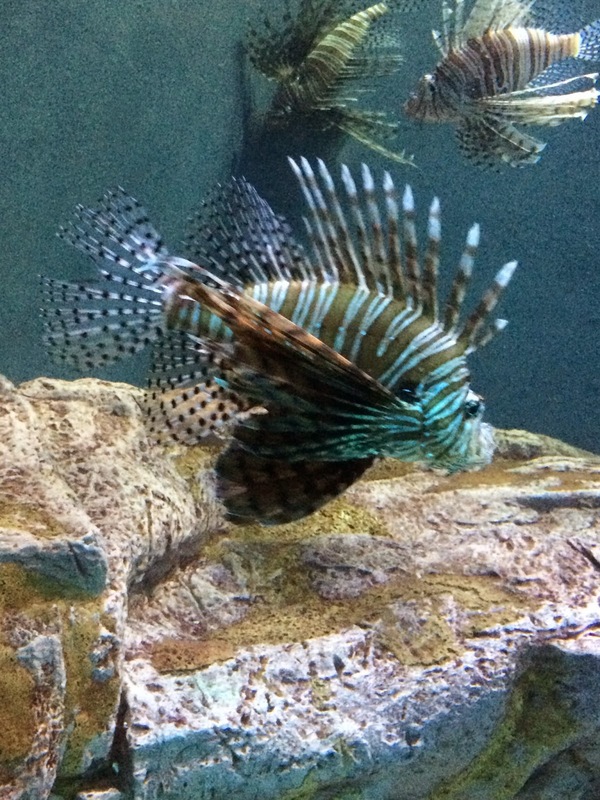 First stop, the Texas State Aquarium! If you’ve been around for a while, you know my love of animals. I am a member of the Houston Zoo after all. Which, by the way, got us a 50% discount off of our tickets. SCORE! I loved seeing all the animals and the dolphin show was amazing! 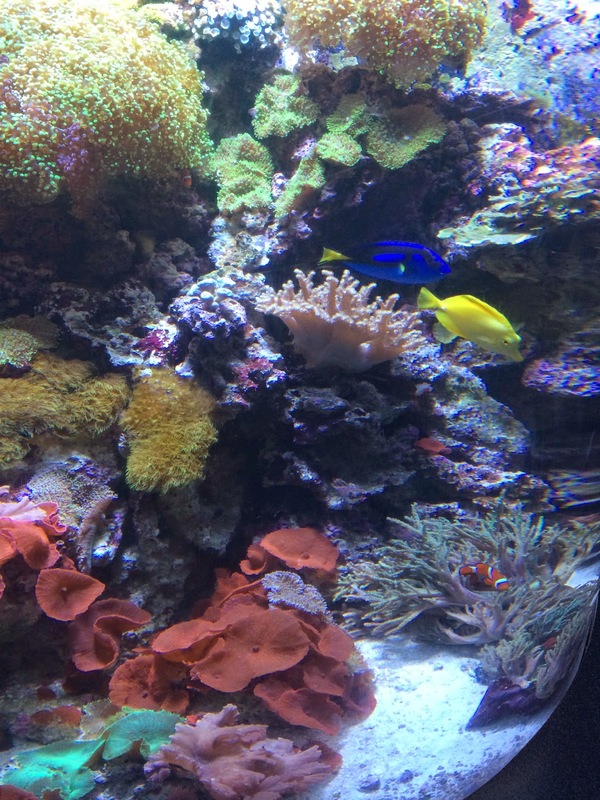 Hey look to the right, it’s Nemo and friends! After a few hours at the aquarium in awe of dolphins, watching the otters play and petting sting rays, we went on a walk over to North Beach for lunch! The aquarium is actually near several beach/ocean front restaurants, so we were able to keep our car in one place and walk around. Eventually we found a cute beachside restaurant that was mainly outside and looked like it had a pretty lively bar. Fajitaville had decently priced, yummy Tex Mex and awesome margs! Frozen house marg with no salt. Yes please! I also splurged and had the nachos with chicken black beans and white cheese. They were delish. Our final day in Corpus was spent at the USS Lexington! This huge boat is in the same area as the aquarium (again only 5 minutes from our hotel). The USS Lexington is a retired Navy aircraft carrier that made it through BOTH world wars. It was launched in 1942, decommissioned in 1948, recommissioned in 1955 and officially retired in 1991. The Japanese nicknamed her “The Blue Ghost” because it was one of the few ships of the blueish-grey coloring and every time they thought they had brought her down, she would always be back and ready for action! The ship itself is very neat and there are 5 separate self-guided tours you can go through on the boat. We spent a little over 2 hours on the ship and still didn’t see everything. It’s huge! I loved being up on the deck where we could view various fighter jets, planes and helicopters. We were also able to climb up on the guns and pretend we were shooting them. Kind of awesome. This thing is a little boy’s dreamland! After several hours of walking around, this girl needed food in her belly, so lunchtime it was. We walked over to a little beachside joint called Pier 99. They had tons of seafood (and non-seafood) options. I splurged again and had the shrimp poboy! It was worth every bite. The entire restaurant is kind of outside, but there are covered areas. It’s right on the water and a very chill place. I wish it hadn’t been so windy on Sunday so I could have enjoyed the atmosphere more!. After lunch, we were on our way back home! We had two puppies that were probably missing us. Plus it was Easter and I wanted to see my family a bit. Overall, it was a wonderful trip. We did everything I wanted from the beach to the aquarium, being with friends and the USS Lexington. Most importantly, I got to spend the weekend with my husband and just enjoy all the time with him. It was pretty perfect and only a quick drive down to the coast! Do y’all do anniversary trips? We’ve done Washington D.C., New Orleans and our European cruise for our first 3 anniversaries! Hoppy Holy Thursday y’all! 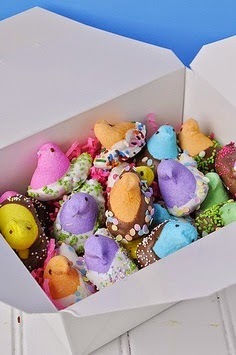 It’s almost Easter and almost the weekend! 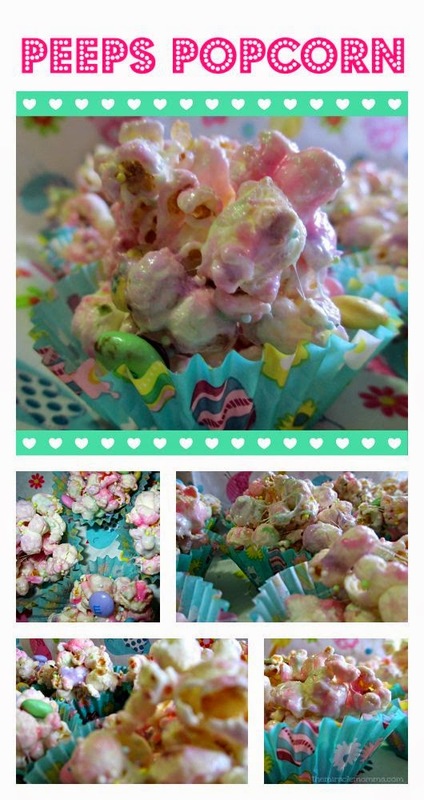 I figured I’d share a few Easter themed ideas I’ve had on the blog in the past and a few others that I’d love to try one day. I promise they won’t disappoint! Click the links below to take you to the site for a how to! I actually made these last year for my family, but apparently I didn’t blog about it! I haven’t tried doing these yet, but I want to. 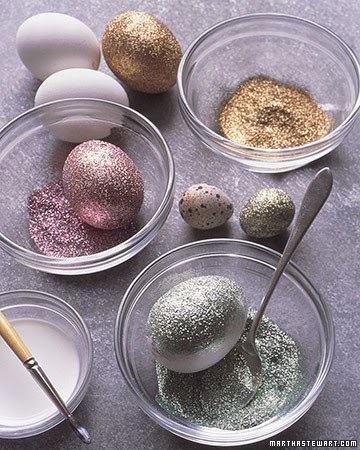 Oh how I love glitter! This just looks delicious and like something my dad would love! Shameless plus to get y’all to try the workout I posted yesterday! 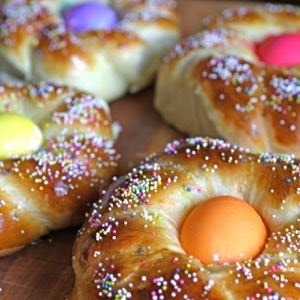 Do y’all have any other Easter recipes, workouts or projects I should try? Have a wonderful and safe Easter! I may pop in tomorrow or I may just take a computer free day. We shall see! 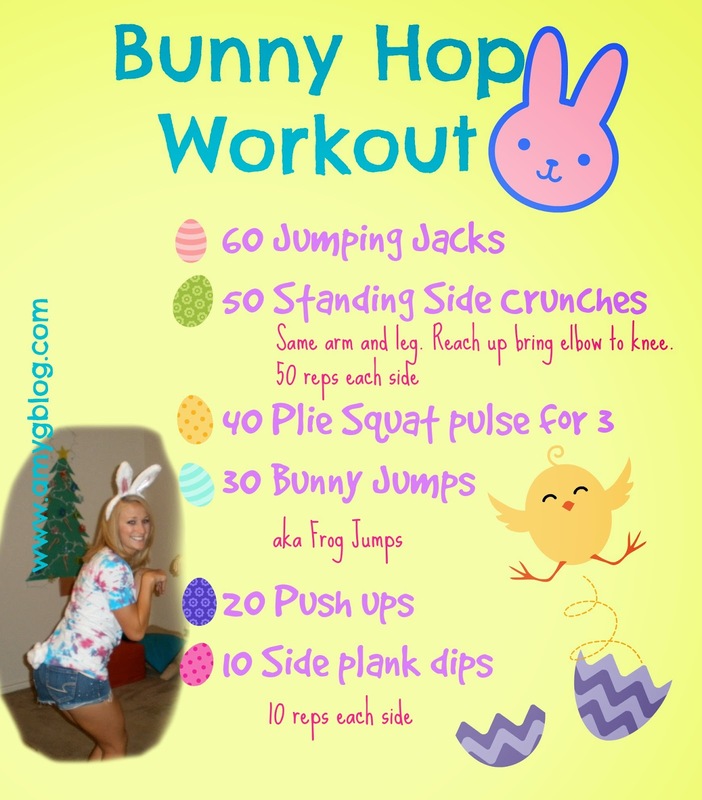 Do the Bunny Hop…Work Out! It’s Wednesday loves! I’m pretty pumped about this week, or really, this weekend! I get a 4 day week. 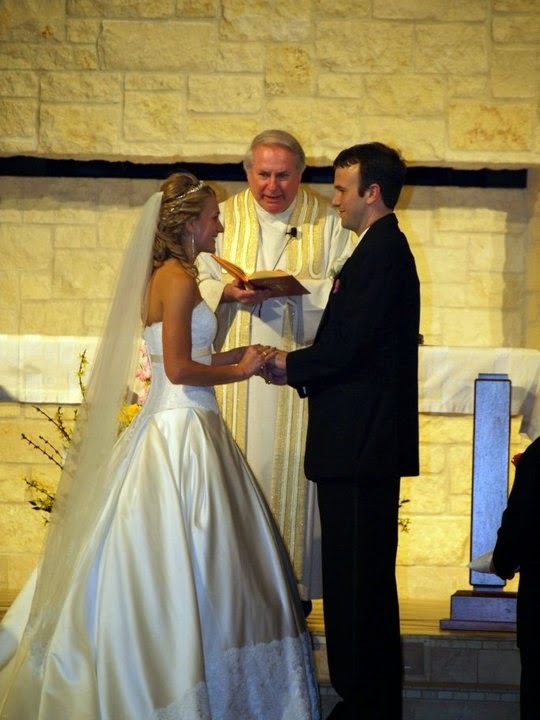 I’m taking Friday off and being wisked away by my wonderful husband to Corpus Christi for a wonderful anniversary weekend. Plus on Sunday we’ll stop off in Sugar Land to celebrate Easter with my family! Sounds wonderful right? 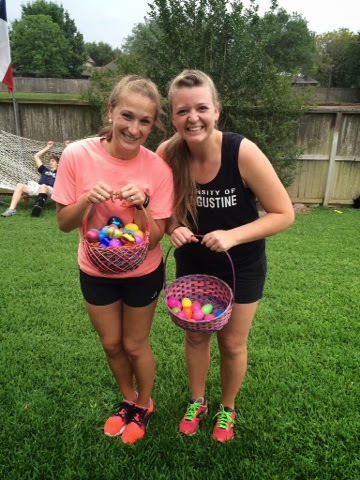 I’m sure many of you are traveling or visiting friends or family, so here is an Easter “themed” workout that you can squeeze in before leaving town or even at home. No weights required. All body weight workout! Go through this workout 2-3 times and you’re good to go. You can even split it up and do each round at different times of day to increase your heart rate and get your blood flowing! If the weather is crummy, you can do this while watching tv! Or if you’re looking forward to a nice sunny weekend, try it outside! I’ll be doing it on the beach this Saturday for sure! Mine is definitely outdoors! I love being outside especially this time of year! 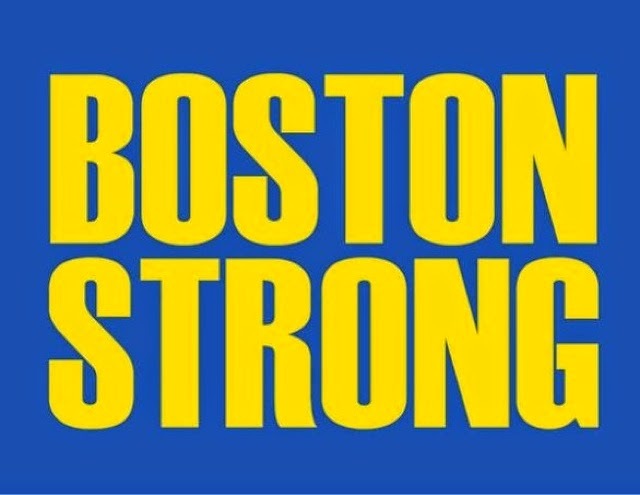 It’s hard to believe that already a year has passed since the bombings at the Boston Marathon last year. As a runner, it is a day that will be hard to forget for many reasons. 1. How the running community persevered and came together in a moment of sheer panic and disorder. 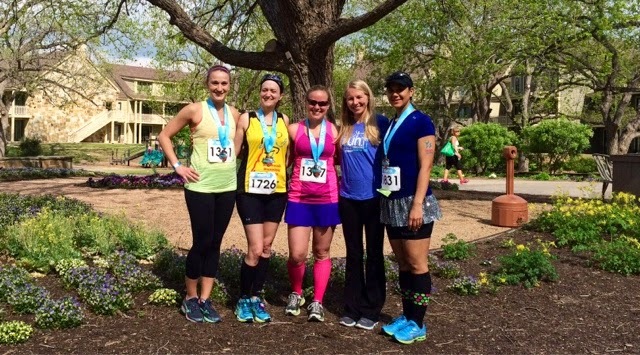 The running community is a strong, supportive family. Not one to be messed with. You want to demoralize humanity? Starting with a group of the strongest people, physically, mentally and emotionally, is not the place to go. Seeing runners, police officers, spectators and random strangers helping one another just goes to show how we come together. 2. 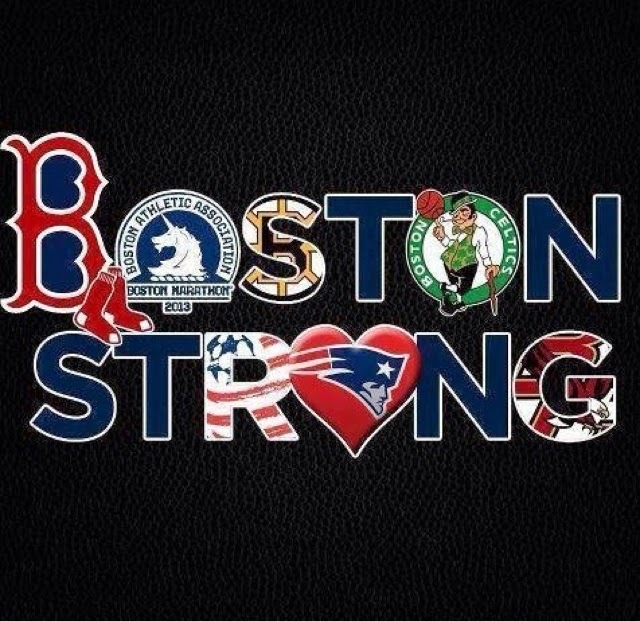 How Boston came through and provided strength when it was at its lowest. After visiting Boston last September, I fell in love with the city. Boston is a strong city that kicked back and rose above the smoke to be strong for those in need. 3. How the survivors are pulling through, staying strong and sharing their stories. I have been engulfed in articles about Boston survivors and where they are now. Many have over come so much: loss of limbs, loss of family members, loss of peace of mind. Sharing their stuggles and rising above their pain is incredibly inspiring. Today we unite, a year after tragedy and stand strong. This weekend we cheer on the runners who have worked so hard to participate in one of the greatest running accomplishments imaginable: The Boston Marathon. As a running community, we will persevere. As a country, we will unite. Take some time today to pray or offer a moment of silence for those lost and injured during last year’s tragedy. I know they would appreciate it. This is How I Zooma! Do y’all remember last October when I announced I had been selected to be an ambassador for the Zooma Women’s race series? If you don’t remember that, you probably remember the countless posts where I told you to sign up! Well I know that some of you remember because I had 12 people sign up using my ambassador discount code! Way to go y’all! Well, this past weekend, I finally got to run the Zooma Texas race and meet all the ambassadors that I’ve been chatting with via Facebook and following each other’s blogs. 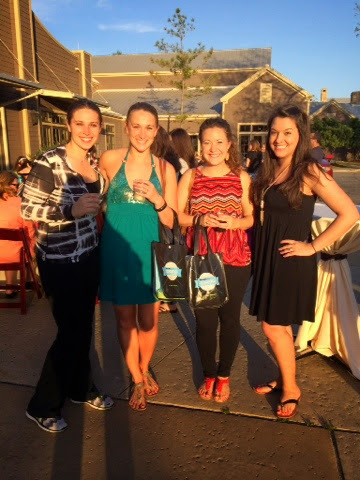 After the expo, we found Caitlin and Melanie and went to the HonestTea Mocktail Party. We had appetizers, HonestTea and some Barefoot wine! My favorite was the sweet red. It was delicious on ice! I also finally got to meet all of the beautiful ambassadors at the Mocktail Party!!! Then it was time for our prerace dinner. We headed to the casual dining cafe in the resort and indulged in their pasta buffet! It was a yummy evening before race day dinner. Complete with pasta and desserts! 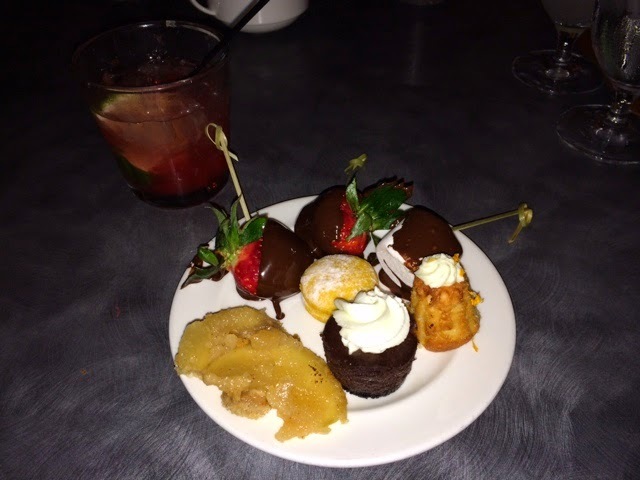 We really loved the dessert bar which was the best part of the buffet if you ask me. We may have had a bit too much to eat, but such is life! Saturday morning our alarms went off dark and early at 6:00am. Really it wasn’t a terribly early wake up call for race day. Since we were staying at the resort and the race started and ended there, it made everything so much easier! 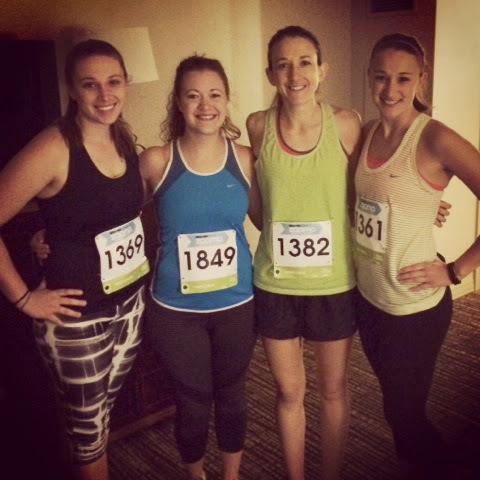 We were able to get up, take our time getting ready and snap a few pictures before heading down to the race start line! The race start went so smoothly! There were plenty of port-o-potties (which is really important for runners on race morning), it wasn’t overly crowded, it wasn’t rushed and the whole morning just felt so smooth. That’s hard to accomplish on race day. It wasn’t a huge race, just about 800 half marathon runners, 250 for the 10K and 215 for the 5K. 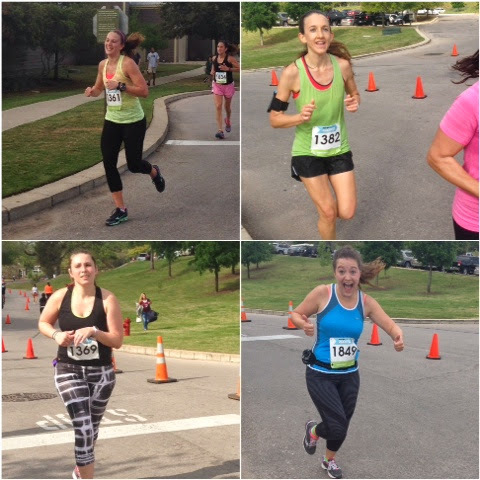 I think the size of the race helped in organization, but let me tell y’all, those Zooma ladies totally have it together. They know how to throw a race! Now onto the actual race itself! Saturday morning was pretty muggy with 95% humidity and about 65 degrees at race start. Far from ideal, but luckily there was a nice breeze that kept the temps feeling a bit cooler. We took off right at 7:30am and were on our way up the first of MANY hills. Y’all I knew Austin was hilly and that this would be a hilly race, but holy glutes! Those this were crazy. It was a constant battle of up vs down. We’d go up a lot, down a little, then flat for a bit. The first few miles I kept pretty slow to get my body warmed up and to let me lungs get a feel for the hills. Despite the humidity, I was actually feeling pretty good. After the mile 2 marker, I picked up my pace to a solid 9 min/mile and still felt strong. Melaine and I part ways right around there since I was feeling it. The water stations were about every 1.5 miles apart and they had Cytomax and water at each. There was only one part of the race that I felt like they needed a water stop, but I’ll get to that later. Overall, the water stop timing was great. After going up and down and up and down for the first 7 miles or so, we hit a solid flat area which was a 1.5 mile down and back so we got to cover that ground twice! I really appreciated the fast flat and picked up the pace a little since I still felt great. (I didn’t plan on running this race very fast. I was aiming for roughly 2 hr finish since it was so hilly!) I loved the out and back because I was able to see Melaine, Caitlin and Ashley and we cheered each other on! There were also several volunteers and a few spectators cheering that we got to see twice! 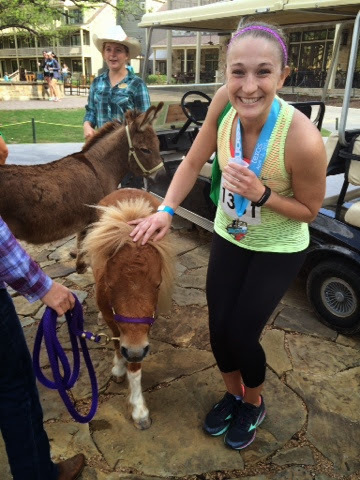 When we hit mile 10, we started to weave around the golf course at the Hyatt Lost Pines. This was a rough way to end the race because weaving back and forth and being able to see it all made for a LONG last 3 miles. BLEH. There was water at mile 10 then not until shortly after mile 12. Since this is when the sun started to come out and the end of the race was nearing, I felt like there should have been a water station at mile 11.5. I was dying for a sip of water by the time I got to that final water station! From there I realized I was easily going to finish sub 2 hours and got pretty excited. I finished the race strong and it probably helped when I saw Ali standing at mile 12.9 cheering me on with the biggest smile and the loudest, best cheering voice. I totally picked it up and rocked the last 0.2! I rounded the corner, saw the finish line and went in for the final sprint! My official finish time was 1:56:31…not too shabby! Several minutes off from a PR, but also, several minutes faster than I anticipated! After I cooled down, I went back out to Alison to cheer on the rest of the runners and my girls! I was so happy I was able to run Caitlin in for her last little bit of her first half marathon! She finished in less than 2:30 which was her goal! All of my girls did awesome on this hill course! And Alison really is the best cheerleader ever. We’re working on becoming professional race cheerleaders. Sounds awesome to me. After the race, we got to indulge in lots of post race goodies! Food, wine and animals! What? Animals? That’s right. Check out this super cute miniature pony I got to hang out with! We named her Toni but apparently her real name is Little Feather. I liked Toni. Toni the Pony. Some of the ambassadors also met up again in the wine garden post race for another quick pic! Overall, the Zooma race was awesome. It was by far the most challenging course I’ve run which made me feel even better about my time considering this wasn’t a goal race for me! 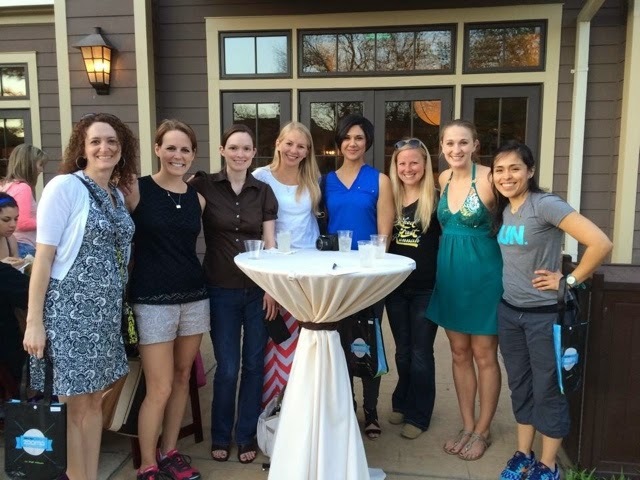 The ladies behind Zooma have race weekend down to a T. From the easily organized expo to the pre-race mocktail party. From the resort race location to the calm and simple race start. From the course set up to the post race party, everything they did was well organized and made you feel great. There’s nothing better than feeling great on race weekend! Way to go Zooma and thank you for the amazing opportunity to be an ambassador. I loved every minute of it! 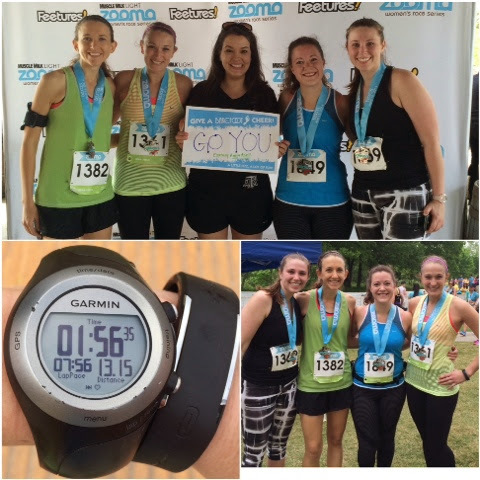 Have you ever run a Zooma or women’s race? What’s the hardest race course you’ve ever tackled? When it comes to cooking dinner in the Gougler household, our habits are very cyclical. I go through phases when I’m meal planning and cooking 4-5 nights a week, then I don’t want to cook or go to the store so we only cook one week night. I know it’s bad. We just live in a part of town where there are so many good restaurants. And they’re close. Luckily, I’m on a cook at home kick right now. I mean, bikini season is right around the corner and we all know that abs aren’t formed in the gym. They’re made in the kitchen! It’s all about what you put into your body . I’m not a steak and potatoes kind of girl. I’m not a red meat kind of girl at all. 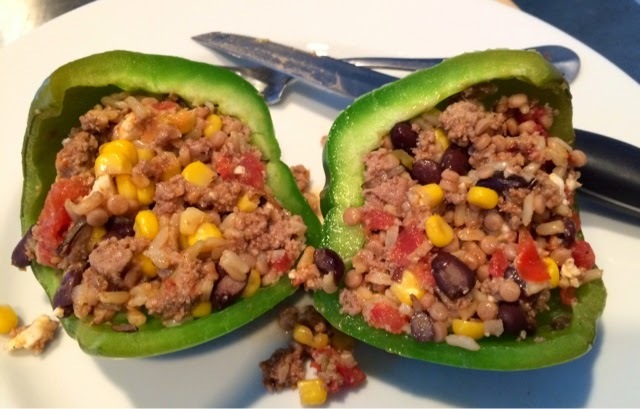 Hence the turkey in these delicious stuffed peppers! I’m telling you, you won’t miss the red meat in these, but feel free to swap ground turkey for ground beef if your heart tells you too. Preheat oven to 350 degrees F. Spray a 9×13 baking dish with non stick spray. You can also line the dish with parchment paper if available. Brown your ground turkey. Season with salt, pepper and 1/2 teaspoon chili powder. 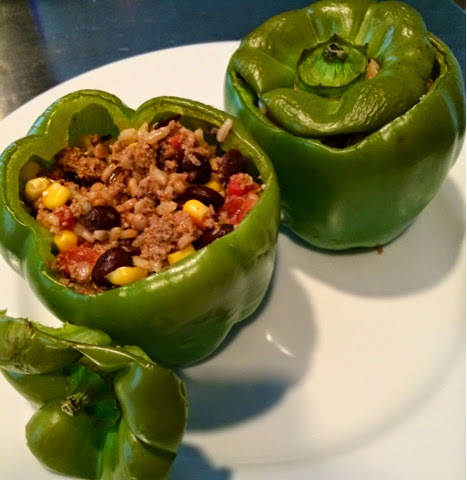 Cut off the tops of your bell peppers. Remove stems and seeds from inside the pepper’s cavity. Rinse thouroghly to remove remaining seeds. 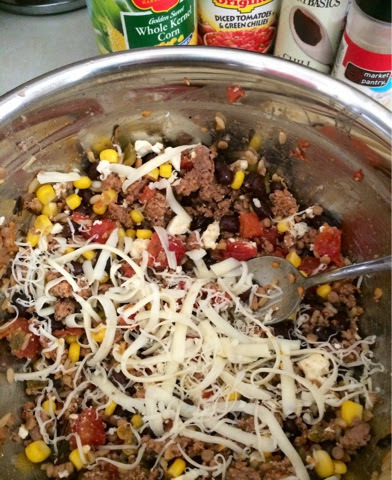 In a large bowl, combine turkey, rice, green chiles, corn, beans, tomatoes, cheeses, garlic, onion and chili powder (remaining 1/2 tsp), salt and pepper, to taste. Fill each each bell pepper to the top. Place peppers on prepared baking dish and bake until the peppers are tender and the filling is heated through, about 25-30 minutes. These bell peppers are gluten free for those of you who can’t eat the glutes. They’re also packed with protein and lower in carbs. The carbs included are low on the glycemic index which will help to control your blood sugar. Perfect for dinner if you ask me! Plus, just look at all of those colors! Now it’s time to enjoy Friday. I won’t be cooking tonight. Or really at all this weekend. 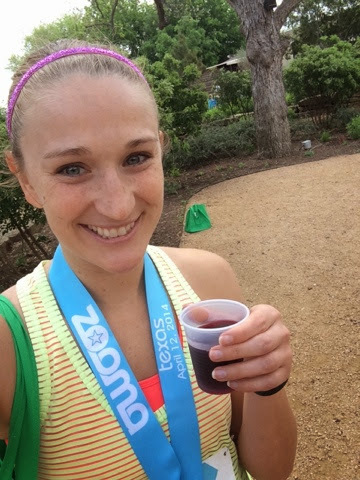 It’s finally Zooma race weekend, so I’m off to the Austin area for a wonderful girls weekend to include a half marathon, lounging by the pool, a few cocktails and time with my girl friends and sister! Have a wonderful weekend y’all! Do you prefer steak and potatoes or turkey and rice? It’s hard to believe that 4 years ago I said “I do” to the man that is not only my best friend, but my partner in crime, my shoulder to cry on, my biggest fan and greatest support system. I’m beyond blessed to have him by my side each and every day. Some days I wonder how he manages to put up with me. Other days I wonder how I manage to put up with him 🙂 But I always remember that this is exactly what we asked for. We want to share in each others ups, downs, spirals and whatever else life throws our way. I thank God every day for this man and I look forward to thanking him for many, many more days to come. I love you James Philip Gougler. Here’s to 4 years and so many more!